After my recent post on the three Korean terms (Moosool, Mooye and Moodo) used to describe the combat arts, it reminded me of one of my first submissions for Totally Tae Kwon Do, in which I describe the differences in meaning between "instructor," "master," and "grandmaster" in ITF Taekwon-Do. Since that essay was never actually posted on this blog I decided to do so now, below — expanded with hangeul and hanja. A related essay by Mr John Johnson (an ITF 4th Dan) links Moosool, Mooye and Moodo with Instructor, Master and Grandmaster, and can be read here. The above photo was taken on the day I received my fourth degree black belt certificate and officially became a sabeom / 사범. Standing next to me is Master Kim-Hoon. What does it mean to be a master? In truth, it depends on the style one does. Most Korean styles like Tang Soo Do, Hapkido and WTF Taekwon-Do attribute the English title master to a practitioner with a 4th Dan (4th degree black belt) or higher. The Korean term used is sabeom or sabeomnim (sometimes spelled “sabum” or “sabom”) [사범], which basically means coach or respected coach, respectively. The suffix “-nim” [-님] is an honorific that is added to denote respect. Depending on the system a 1st to 3rd Dan is considered an assistant instructor, or junior instructor, and a 4th Dan and higher level practitioner is considered a full instructor or master level instructor. In Korean such differences as instructor, master and grandmaster are not made. In Korea all instructors are called sabeomnim [사범님], regardless of their Dan. A special term, kwanjangnim [관장님], is used for instructors that own their own academies. 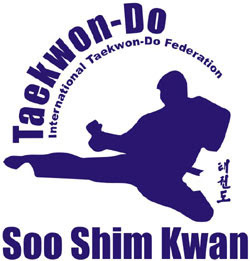 ITF Taekwon-Do, however, uses different Korean terminology for 1st-3rd Dan instructors, known as boosabeom [부사범], 4th-6th Dan instructors, known as sabeom [사범], 7th-8th Dan masters, known as sahyeon [사현], and lastly 9th Dan grandmasters, known as saseong [사성]. In all cases the suffix “-nim” [-님] can should be attached for added respect. Sabeom, meaning instructor, is made up of two root words, “sa” / 사 / 師 and “beom” / 범 / 範. The first syllable “sa” comes from the term “kyosa” / 교사 / 敎師 which means teacher. The second syllable in sabeom means “model”. The sabeom or coach is therefore a teacher after which the student should model him or herself. In other words, the student should try to emulate the techniques of the instructor. The prefix “boo-” / 부- in boosabeom literally means assistant. 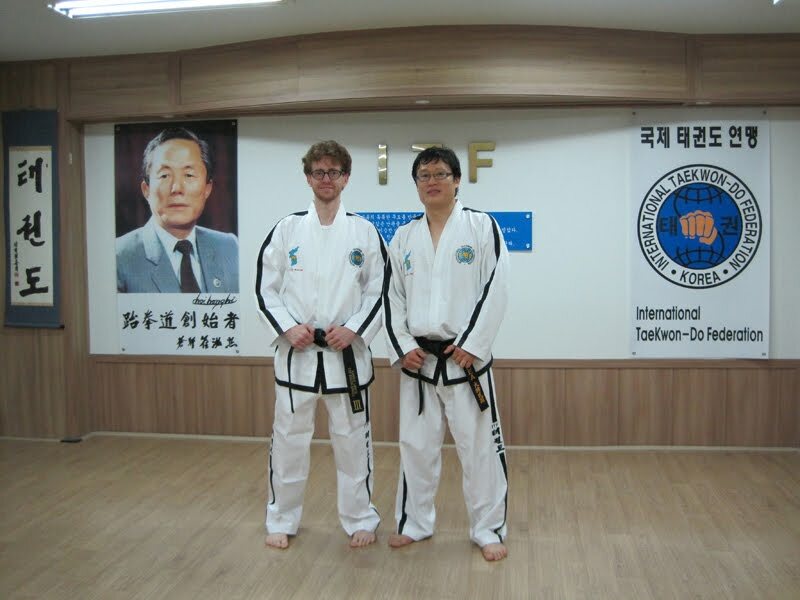 A boosabeom is therefore considered an assistant instructor in ITF Taekwon-Do. This title is used for 1st-3rd Dan practitioners in ITF Taekwon-Do, especially when they teach under a sabeom. 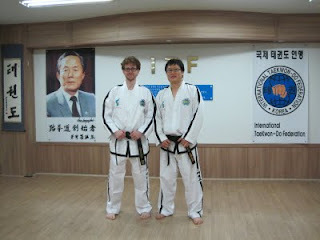 At master’s level (7th-8th Dan) in ITF Taekwon-Do the term sahyeon is used. Again, “sa-” means teacher. The syllable “-hyeon” / -현 / 賢 is related to virtue, wisdom, prudence, or good sense. A wise mother, for instance, is called “hyeonmo.” The implication is that the Taekwon-Do master is not merely a technical teacher, but also a teacher of morality or virtue. Hyeon can also mean “the present” / 現. Understood philosophically, the Taekwon-Do master is a teacher of the moment. This might suggest a Zen understanding where the master teaches their practitioners to “be in the moment” or to bring the principles taught in Taekwon-Do into their everyday lives. While a sabeom could literally mean coach and be restricted to mere physical training, the sahyeon is definitely more than a coach. The sahyeon—master—nurtures both the body and mind of his or her students. Lastly, the 9th Dan grandmaster is called saseong / 사성. Once again “sa-” means teacher. Seong / 聖, here, means “sage.” A sage is a mentor in spiritual and philosophical topics, with wisdom gained through age and experience. In ITF Taekwon-Do, it is implied that the grandmaster is not merely a technical teacher (body), nor just a moral teacher (mind), but also a teacher of philosophy (spirit); someone that can guide you on your life’s journey and give you insight into the deeper truths in life. * It is possible that some Taekwon-Do groups that splintered off from ITF Taekwon-Do may also use these terms. An excellent article and thanks for writing it. I spent ages several years ago trying to find the literal translation for sahyun and sasong. Thank you for the visit to my blog, and I'm glad it provided you with the information you were looking for. Your accusation is completely false. I wrote this article myself using no other reference except ITF Encyclopaedia of Taekwon-Do and using the hanja (the Chinese letters) that these titles are based on. Are you for real? Did you even read Sanko's article? Your statement is completely false. Kido Kwan, shame on you for trying to falsy claim Dr. Soo Shim Kwan's research and work.